Target Audience: Fans of David Tanis. Any home cooks who want to add to their repertoire. 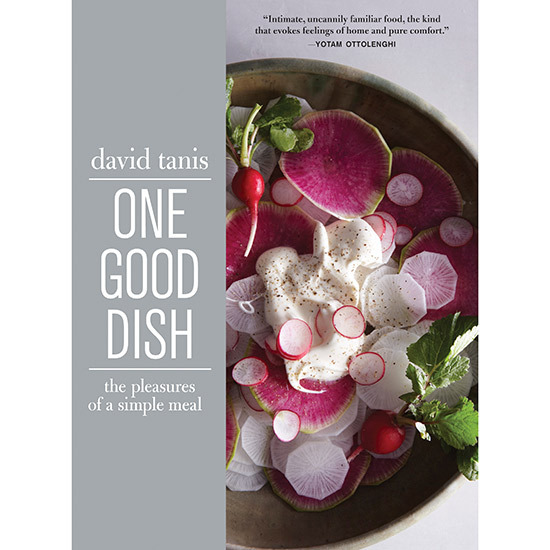 In his New York Times column, “City Kitchen,” former Chez Panisse chef David Tanis often reminds me about how delicious certain basic culinary techniques can be, like say, breading and frying cutlets, or steaming whole fish. His latest book does the same thing. Some of the recipes, like garlic toast, are so alarmingly simple you might wonder if he really needed an entire page to write about how to rub toast with garlic and drizzle with olive oil. Or think, Do I really need this book to tell me how to do so? Tanis is so opinionated about how garlic toast should be, however (“neither too pale nor too dark, and it should have a little ‘give’ in the middle”), I would defy you to not want to make it right away and to flag it for any future garlic toast making. In that same vein, he also includes a recipe he calls “watered down wine,” which sounds insane, until you read his description and think, yes, cold diluted wine actually sounds quite refreshing and practical, at least for lunch. The inspirations for his recipes are pulled from all over the world—there’s wok-fried lamb with cumin right next to a crispy potato galette. These two dishes might seem completely unrelated, but in Tanis’s mind, they’re both cooked over high heat in a cast-iron pan. They are also not eaten with a spoon, as that is the title of the previous chapter. Yes, the book is quirky. It’s not so much a cookbook to pull off the shelf when in search of a specific dish or technique. (For example, there is no roast chicken. In fact, the only chicken recipe is for fragrantly poached Cold Chinese Chicken, which I’ve flagged.) Instead, it’s a book to browse when you’re in need of new inspiration and want some insight from a wise, seasoned and opinionated cook who just might convince you to water down your wine, while teaching you to make grilled cheese in a waffle iron.